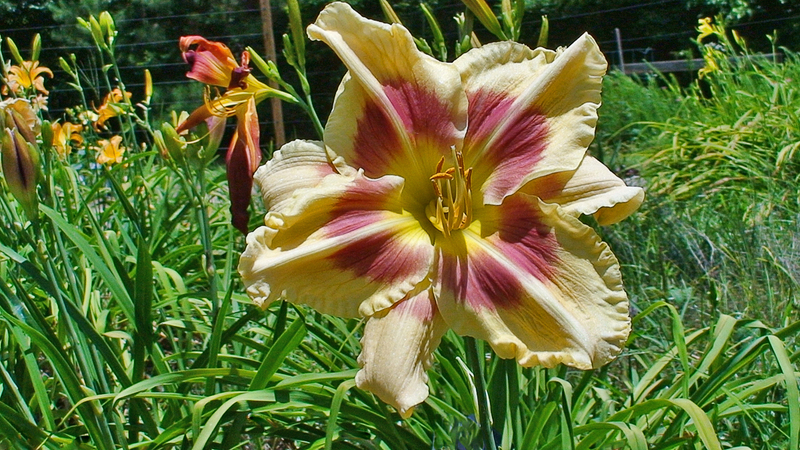 Hemerocallis ‘Carolina Flying Poly Possum’ is a 90% polymerous 2002 introduction. 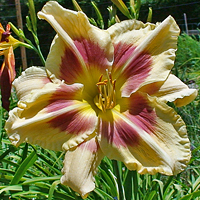 H. 'Carolina Flying Poly Possum' remains one of the more remarkable and admired full form polymerous daylilies since its introduction in 2002. 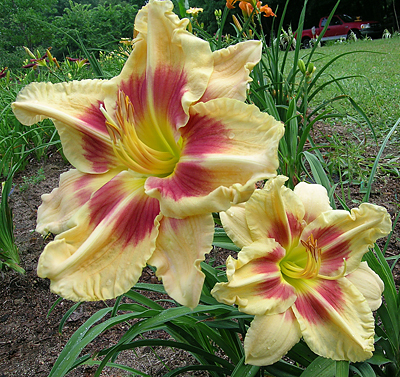 The large 7" blooms are breathtaking. 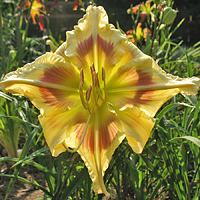 It is a true early morning opener as it opens in the in middle of the night and is registered with an "extended" bloom habit. A genuine nocturnal just like real possum in the wild, except H. 'Carolina Flying Poly Possum' has a pleasant fragrance. 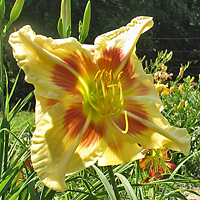 The flower is a heavily ruffled pastel yellow with brilliant diamond dusting and a large soft red feathered eye. 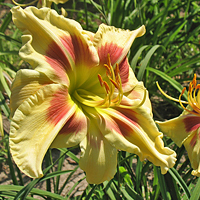 The raised midribs are very distinctive and give a sculpted look to this flat opening bloom. 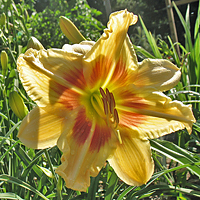 The petals have a thick substance, spongy in feel, and many daylily aficionados believe that H. 'Carolina Flying Poly Possum' is a tetraploid because of its characteristics. However, it is a true diploid. 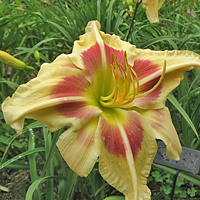 H. 'Carolina Flying Poly Possum' begins in the early bloom season, often going into immediate rebloom. 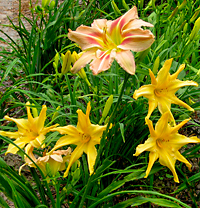 These instant rebloom scapes are often taller and more heavily budded than the first set of scapes. Here in central North Carolina it will rebloom again later in the season. I registered the scape height at 24" but because of its evergreen nature, the further south it is grown the taller the scapes and the more heavily budded and branched it will be. 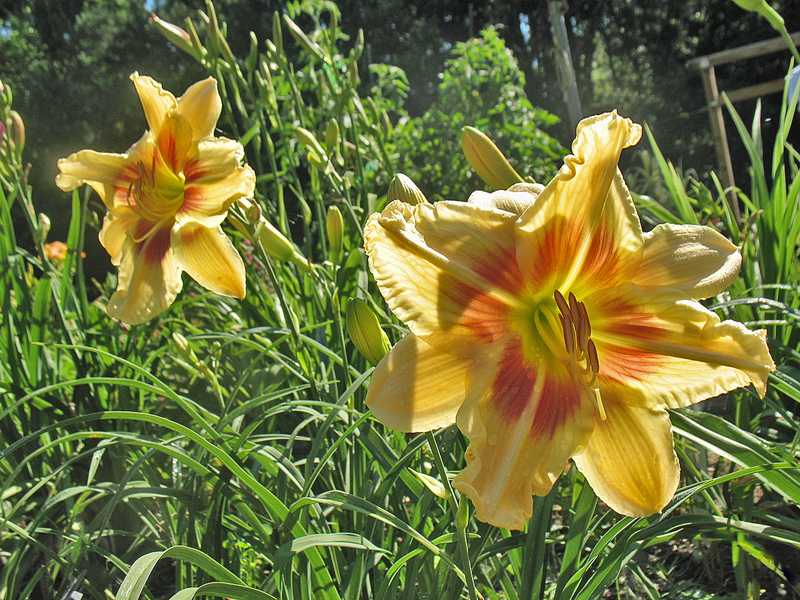 In central Florida it is a continuous bloomer. 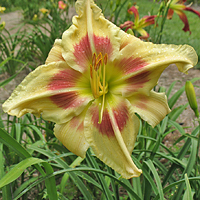 Hybridizers will love this plant but will need patience with its pollen. Pod setting is not a problem, though. 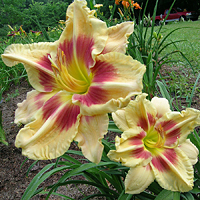 The parentage of this 90% polymerous daylily is H. 'Tepaled Teddy' × H. 'I'm Different'. 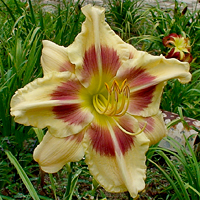 H. 'Carolina Flying Poly Possum' has a remarkable garden presence and always garners visitors' attention when it is is bloom.